The great feud is over. For the past 6 months, there was much unrest in our family. The cause for the divide? Elmo vs. Signing Time. As you know, dear reader, Bertrand loves Elmo. And, despite my best efforts, he despises Baby Signing Time and Signing Time. Victoria, however, loves Signing Time. And, you don't have to be Sherlock Holmes to guess which show she hates instead. Matthew and I would regularly deal with tears when one show was on over another. We even went so far as to repurpose an old iPhone to play Signing Time episodes for Victoria while Bertrand would watch Elmo on his iPad. That all changed with Sesame Street Live this past weekend. 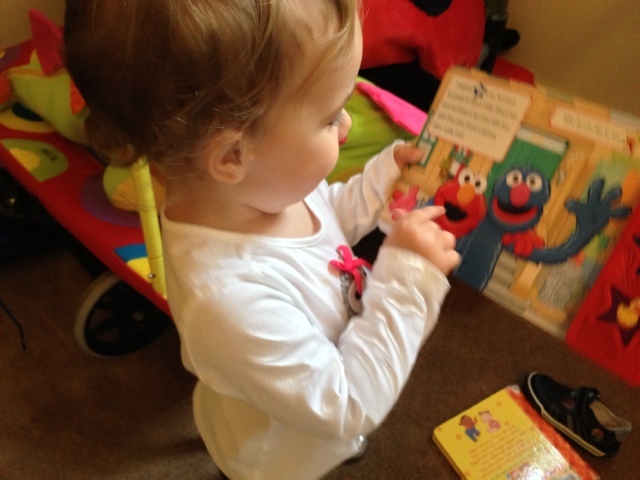 Victoria is now a Sesame Street fan! I'm a friend of Kyle and Annie Kratzsch, parents of Collin, and I've been following your blog for a few years. I love your writing style, love to hear how Bertrand is doing, how Victoria is growing and developing, and how you and Matthew are coping with it all. The new font is difficult to read, however. Can you change it to a font that is a little more robust? One question - will you be taking Bertrand for a genetic profile? I read the story you posted a couple of years ago about a set of fraternal twins who had it done when they were a little older than B., and now they are leading normal lives after medication was prescribed, based on the results of the profile. Thank you for following Bertrand's story! And, thank you for the feedback on the blog format. Since I tend to post from my phone, I don't always have an accurate view of it. I adjusted the fonts and hope you find them easier to read. Please let me know if they still need tweaking. And to answer your question on Bertrand's genetic profile, yes, we did full exome sequencing on Bertrand shortly before I shared that story about the twins. The results took a while to come back, but as a result Bertrand was finally diagnosed this past spring! :) Researchers are using Bertrand's genetic information to hopefully find a treatment (and maybe someday a cure?) for children like him.